Indian energy giant Adani's battle to build the $16.5 billion Carmichael mine in Central Queensland has struck another hurdle with a protracted legal battle with resources company Glencore over the operation of Abbot Point coal terminal. With Adani struggling to gain finance for the mega-mine in the Galilee Basin and still awaiting environmental and mining approvals for the project, the legal battle with Glencore is now set to proceed to trial early next year. Adani is moving to kick Glencore out as operator of Abbot Point coal terminal – which it plans to use for its export hub for its mega-mine – and is also suing them for loss and damages over an alleged breach of contract. The size of the losses is not outlined in the legal documents obtained from the Supreme Court. Adani would not comment on the court case, but the latest legal skirmish will continue to raise doubts about whether its controversial Carmichael mine – which has become a flashpoint for anti-fossil fuel and environmental activists – will ever get off the ground. Adani purchased Abbot Point coal terminal from the former Bligh Labor government in 2011 for $1.83 billion. It was crucial to its plans for a vertically-integrated mine, rail and port project to export coal to its power stations in India. A subsidiary of Xstrata, known as Abbot Point Bulkcoal, had a 10-year contract to operate and maintain the terminal, which is near Bowen, between 2000 and 2010. This was extended to 2015 before Adani bought the terminal. 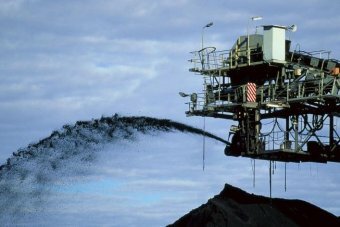 The first terminal, known as T1, is being used to export coal from across the Bowen Basin. It has a capacity of 50 million tonnes a year and is used by BMA, QCoal and Glencore's two mines at Collinsville and Newlands. It shifted 28.7 million tonnes last financial year. Adani also has approval for a second terminal, known as T0, to be used for its exclusive use for its project in the Galilee Basin, and has a capacity of 70 million tonnes. Another Galilee Basin proponent, GVK/Hancock Coal has approval for a third terminal at Abbot Point. But things soured after the 2013 takeover of Xstrata by global resources giant Glencore. Glencore, which has coal, copper, nickel and zinc mines in Queensland and NSW, asked to store 3 million tonnes of coal at Abbot Point coal terminal. Adani, which is racing against the clock to build its Carmichael mine to deliver coal to its power stations by 2017, claims the takeover of the subsidiary which operates Abbot Point was a breach of the original contract. In May 2013, lawyers for Adani sent a notice to Abbot Point Bulkcoal saying they failed to get written approval for the transfer of ownership to Glencore. In June of that year, a show-cause notice was issued and further legal missives were sent in early 2014. But in October 2014, Glencore asked for a five-year extension to the port contract which was refused by Adani saying they had breached the original contract. In late 2014, Adani engaged a health and safety expert to audit Abbot Point Bulkcoal which found a string of alleged deficiencies. A second audit report in 2015 found the original deficiencies "which posed a significant risk to safety or health of people" at Abbot Point coal terminal. A fourth notice to remedy the breaches was sent to Glencore in May this year. It outlined nine major non-compliance issues in relation to the original audit and 25 minor non-compliances. Glencore fired back saying the fourth notice to remedy included errors and was the "latest example of concerning behaviour by Adani". ​Adani continued its bid to kick Glencore off the terminal, saying it had failed to keep the terminal in good condition. But in June Supreme Court Justice James Douglas said Glencore was allowed to continue to operate the terminal until the court case was resolved. Adani's Carmichael mine was further delayed last month when the federal court set aside environmental approvals for the project. Federal Environment Minister Greg Hunt was given another six to eight weeks to reassess the impact of the mine on two threatened species - the Yakka skink and the ornamental snake. The court action by little-known environmental group, the Mackay Conservation Group, led to the former Abbott government introducing legislation to limit legal challenges against big resources projects. There has been growing speculation the changes to the Environmental Protection and Biodiversity Act would be dumped by the new Turnbull government, but there has so far been no decision. Adani Australia chief executive Jeyakumar Janakaraj said the company was committed to the Carmichael project despite the delays. Coal India Ltd has reported fiscal year-to-August coal production is up 9.4% year on year, triple electricity demand growth of only 3.1% year on year. With domestic coal production running at double electricity demand growth, inevitably coal imports have proven the swing factor, with reports showing imports have declined 5% year on year in July-August 2015. But the coal-fired power sector remains in serious financial distress, and operating rates have dropped to a new low of 58.4% in July 2015. In contrast, the Indian solar sector is seeing record interest, with the latest 500MW tender in Andhra Pradesh in September 2015 being oversubscribed tenfold. With many new global entrants bidding a collective US$5bn, the suggestion is the tariff may set a new record low below Rs5/kWh (with zero indexation for 25 years). The onshore and offshore wind, hydro and energy efficiency sectors are all showing positive momentum, assisting in the diversification of the Indian grid and building domestic energy security. Momentum remains positive for all but imported thermal coal demand. Coal India Ltd production is up 9.4% year to-date year-on-year in April-August 2015, and dispatches are up 8.3% yoy YTD in the same period, suggesting rail logistics blockages are gradually being overcome. This builds on the record 6.9% growth in production in the year to March 2015, a step-change up from the 1.5% pa growth evident in the prior five years. The government is preparing the fourth round of coal block auctions to private companies. The 45 operational coal blocks that have so far allotted to the private sector will start to really ramp up production into 2016. Another 160 mines are listed to be auctioned, with a potential 500Mtpa of production from mines currently generating an estimated 60Mtpa. Total coal imports into India were down 5.1% year-on-year in July-August 2015. August 2015 imports were 18.6Mt, down 4% month-on-month but up 2% year-on-year. July 2015 total coal imports were down 11% year-on-year (yoy). This looks like a historic turning point after the annual 20-30% yoy growth in coal imports over the prior six years, again hinting that a peak in coal imports has been reached in mid-2015. The national peak power deficit in July 2015 was 2.6%, against 3.5% in the same month last year. The annual peak deficit for 2015-16 is expected to be only 2.1-2.5%, a huge drop from the 4.5% for 2013-14 and the near 10% deficits reported in the preceding years. The build out of interstate transmission capacity is a key part of the medium term solution. “Discom (state electricity distribution companies) resolution is on the cards and we are very confident to have been able to create a sustainable robust framework in consultation with states,” said Energy Minister Piyush Goyal. This remains a key roadblock, and failure to resolve systemic Discom losses will stymie growth. In July 2015, the national average thermal power plant load factor (PLF) declined to 58.4% – the lowest in three years. This suggests there has been a significant coal-fired power plant overbuild. With electricity demand growth not as strong as expected, coal-fired power plants are at risk of being stranded from both an inability to access cheap domestic coal and from weaker than expected demand. Power at any cost is not a viable solution – affordability is a second key constraint. This development is following the Chinese pattern where coal-fired power plants are rapidly being put at risk of becoming stranded assets, with utilisation rates in China year to date 2015 reported at a record low of only 49% as the nationwide average. Indian industrial production grew 4.2% in July from a year earlier, with April-August 2015 electricity production growth running at only 3.1%. With electricity system growth running at only half the reported GDP growth of 7% yoy, the need for dramatic new generation capacity additions is diminished. Mercom Capital monitors the Indian solar market, and in a market update published August 2015 put Indian solar at 4,349 MW of operational PV and 209 MW of CSP, for a total of over 4.5 GW. An additional pipeline of over 7GW is underway, a massive acceleration on the 1GW pa of solar installs seen in the last two years. Bridge to India reports tenders for project development and EPC issued by Solar Energy Corporation of India (SECI) and National Thermal Power Corporation (NTPC) add up to 3.9GW, and several new tenders are expected. 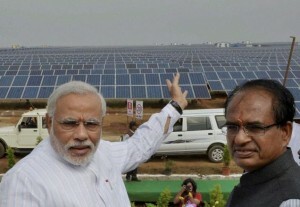 SECI is already developing a 750MW project in Madhya Pradesh. Projects under development, recently concluded allocations and ongoing allocations at the state level add up to 7GW. The new allocations from this are spread across the states of Punjab (500 MW), Haryana (150 MW), Bihar (150 MW), Tamil Nadu (1,240 MW), Telangana (2,000 MW), Madhya Pradesh (300 MW), Andhra Pradesh (500MW) and Jharkhand (2,000 MW). Bridge to India reports a 500MW tender in Andhra Pradesh in September 2015 received bids totalling 5.5GW, a tenfold oversubscription. Tender results are to be announced October 2015, with suggestions that tariffs below Rs5/kWh have been submitted. Prominent new entrants into the Indian solar sector with this tender included SoftBank, Trina Solar, Enel, Energon, Solar Arise, Suzlon and Greenko. The depth of global corporate interest is growing with each month. September 2015 saw another major new solar step forward, with the Adani Group and Jindal Steel & Power Limited (JSPL) sending proposals to the Jharkhand Renewable Energy Development Agency to set up solar power capacity of a combined 2 GW. This is JSPL’s first major entry into the Indian solar sector, and for Adani, this represents the latest of seven major solar initiatives in India announced just in 2015 to-date, totalling new capex of US$16bn. If these proposals progress, it would represent a manyfold expansion of solar relative to Jharkhand’s existing total of only 16MW of solar installed. “We are creating a framework that whenever the grid reaches there, the off grid guy can supply that power like net metering into the grid, so we are creating that framework to encourage people to go off grid,” said Mr. Goyal. Incentivising offgrid, decentralised renewable solutions is an effective, lowest cost solution to energy poverty. Despite certain coal industry claims, expensive imported coal isn’t seen as a solution. In September 2015 the Energy Minister also said that government plans to bring down the cost of each LED bulb to Rs.44 from the current level of Rs.74 through competitive bidding. This further builds on an 80-90% cost reduction sourcing program for LED already achieved over the last year. Goyal has quantified the electricity savings from an LED phase in program at 100TWh or well over US$2bn annually. Energy Minister Goyal also said: “If you go back in history for the last five years, the entire hydel industry has come to a standstill in India. We’re going to revive it. People have lost interest about investing in hydro. I want to reignite that interest.” 46GW of hydroelectricity is strategically significant as it boosts economic expansion and employment in India’s northeast, Goyal added. It also brings strength to the electricity generation sector, diversifying the overreliance on coal while balancing renewable energy production. The first target is to resolve the years-long delay in the US$1.4bn, 1.2GW Teesta-III project in northeastern Sikkim state that is 90% complete. Goyal said his next objective is to speed up NHPC’s 2GW Subansiri hydroelectricity project spanning across Assam and Arunachal Pradesh states. While much of the press focus in India is currently on solar, India already operates the fourth largest global wind farm fleet of 24GW, behind only China, America and Germany. Goyal has a stated target to lift this to 60GW by 2021/22, and post the equity recapitalisation of Suzlon Energy in May 2015, the wind sector is once again looking re-energised. In September 2015 the China Light and Power Group of Hong Kong (CLP India) announced a new Rs6bn (US$90m) 9.15% pa, 3-5 year tenor green bond issue to assist financing of its committed new wind projects of over 1,000 MW across six states. CLP India already has the largest wind fleet in India, with commissioned wind energy capacity of 724 MW. In order to overcome site availability constraints, Energy Minister Goyal is looking at repowering existing wind farms, replacing the old 0.2-0.3MW turbines with modern turbines of 2-3MW capacity each – giving a tenfold lift in output from existing wind farms. In September 2015 Prime Minister Narendra Modi’s government adopted a new policy for India’s offshore wind industry. The Ministry of New and Renewable Energy is now authorised to start allocating blocks offshore for wind developments. This represents another step forward in India’s pursuit of a targeted 175 GW of renewable energy by 2022, although IEEFA expects offshore wind to only make a material contribution next decade. In September 2015 the Indian Government announced its second reverse tender auction for subsidised gas supply to stranded gas-fired power generation capacity for the six months to March 2016 at a maximum electricity price of Rs4.70/kWh. The first auction for the June-to-Sept’2015 period successfully revived 10,270MW of previously stranded gas capacity to provide gas-fired electricity generation for 30% of time, sufficient to provide peak load management to help grid stability at a minimal incremental system cost. The entry of a wide range of global energy firms into the Indian renewables sector is rapidly mobilising financial capital and providing substance to the grand transformation vision announced late in 2014. While the electricity sector challenges remain extreme, Energy Minister Goyal continues to achieve wins on a range of new initiatives. The 5% yoy decline in coal imports in July-August 2015 hits at a key turning point. Two months isn’t a trend, but momentum is building. Tim Buckley, Director Energy Finance Studies, Australasia at IEEFA. Information regarding the Galilee Basin is collected from various media outlets and compiled to this new email address, galileebasinalliance@gmail.com. Anyone can comment or send news and they will be broadcasted to this local email list. The Galilee Basin Alliance is an informal network of landholders and community members in Western Central Queensland who are concerned about the expansion of mining in our region. For more information contact Denice on 4651 1696, Paola on 4985 3474 or reply to this email. No pay : No get special deals from governments?